Beginning Oil Painting - Land O' Lakes Area Artisans, Inc. Learn the art of this classic, colorful medium with Barbara Friedman! Oil paint has been the choice of master artists for centuries. Dutch artist, Jan van Eyck (1390-1441) is credited with improving the way in which oil paints were formulated. Today’s techniques & paints have not changed much from his formulas. Various oils (linseed, poppy seed, and walnut or safflower oils) are used to suspend precious ground pigments. Because of the slow drying quality of oil, artists can work longer on paintings, and colors blend easily with one another. Another advantage of oil paints, is flexibility and depth of color. They can be applied in many different ways – glazes diluted with turpenoid for thin layers or used thickly for impasto techniques. Opaque, transparent and translucent painting styles, and many textural variations, all lie within an oil paints range. 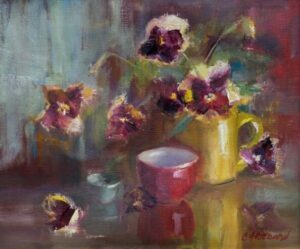 Join artist Barbara Friedman for this workshop with this versatile, colorful and classical medium! Supply List: Bring any Oil Painting Supplies you may already have. Canvas will be provided. Paper towels and Turpenoid or other odorless paint thinner. Bring a bag lunch. Apron or smock. Barbara Friedman is from the Milwaukee area and also spends time at her seasonal home in Watersmeet, MI. She is a multi-disciplined artist, working in oils, watercolor, and stained glass. During the warmer months Barbara can be found plein-air painting in her perennial gardens, often inviting friends to join her. During winter, she is back inside the studio to focus on stained glass art. Barbara enjoys teaching and sharing her many talents. She is especially motivated to teach the skills that her students will need to connect with their own creative spirit and style. Payment/registration deadline: September 19 No refunds will be given after the deadline date.